The brooches awarded to all finishers in the IGAL Championships in 1980. When Walter Ross and his fellow enthusiasts started up the Veteran Harrier movement in Scotland in the early 1970’s, no one thought that a race such a this would be one of the results. 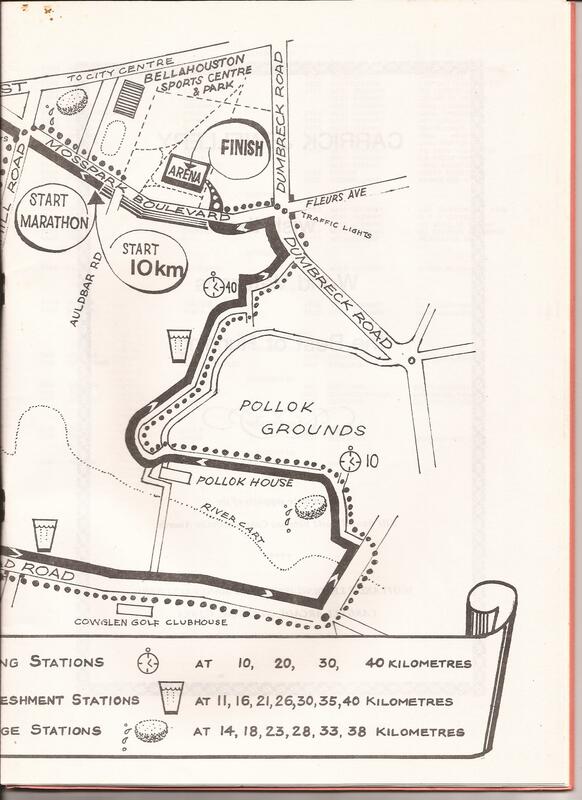 Held at Bellahouston, starting on Mosspark Boulevard and finishing inside the park, it attracted runners – Olympians, international stars and club runners of all standards – from all over the world. There were 704 finishers in the 10K road race and 464 finishers in the marathon. The Scottish Organising Committee did a wonderful job and it consisted of Bob Dalgleish (Chairman) , J Bissell (JP), Owen Flaherty, Tom Fletcher, Dale Greig, Ewan Murray, Norman Ross (Treasurer) and Walter Ross (Secretary). There were events for both men and women and the results for both will go up. Some spot times: 50th – 35:35, 100th – 37:24, 150th – 39:11, 200th – 40:39, 300th – 43:33, 400th – 46:16, 500th – 49:59, 600th – 54:38, last Scot – Joe Cascarina (M5) in 60:56, last finisher was Honji Takedze of Japan in category M9 in 1:24:02. Among the familiar Scottish names crossing the finishing line were John Barrowman (Garscube – 35:0), Jim Sloss (Beith – 35:15), George Brown (ESH – 35:14), Henry Summerhill (Shettleston – 35:22), Ian Whyte (L & L – 35:22), Ian Leggett (Livingston – 35:39) and Bill Ramage (Springburn – 35:41) who were all on page one of the 13 pages of results. The team (ie country results were not so good for the host nation with England winning six races and Switzerland and West Germany one each. 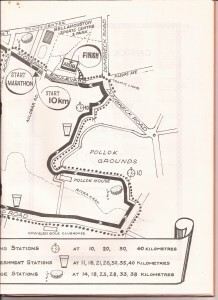 In the women’s races there were only teams in three categories,with England winning one and West Germany the other two. The running over, there was a delegates conference at 2:00 in the Palace of Art, Bellahouston and in the evening, a civic reception and presentation of awards for the 10K at 7:00 pm. On Sunday, 24th April it was the turn of the marathon runners who were required to run three laps of the 14K route with Timing stations at 10, 20, 30 and 40 kilometres, refreshment stations at 11, 16.21, 26, 30, 35, 40 kilometres and sponge stations at 14, 18, 23, 28, 33 and 38 kilometres. 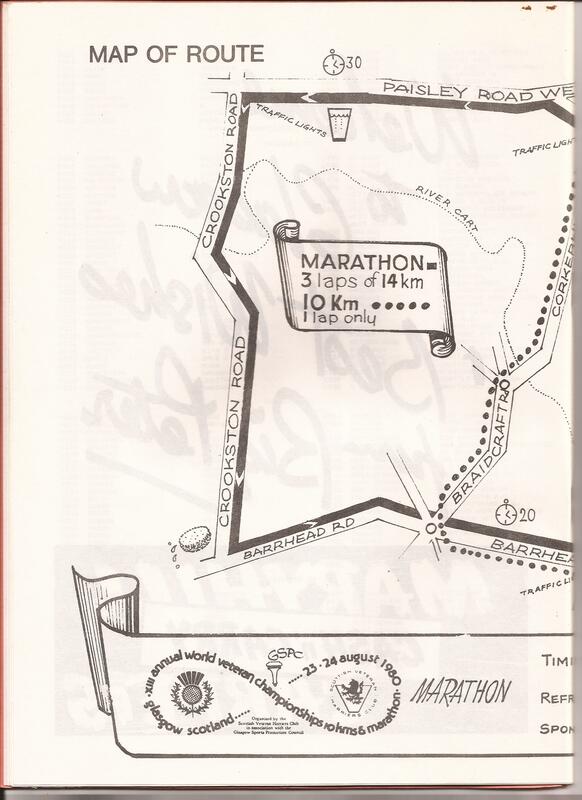 Appropriately enough, in the last and hardest test of a wonderful weekend, the marathon was won by the wonderful Donald Macgregor of Scotland by a full 15 seconds from Robinson of New Zealand in 2:19:23. The big names were out in this one – an autograph hunter’s paradise for anyone into athletics history. Donald of course, Ron Hill, Gordon Pirie, Mick Molloy, Jim Alder, Eddie Kirkup and many, many more. Scottish marathon champions on display included Alastair Wood, Gordon Eadie and Charlie McAlinden. The top thirty here were as follows. Some spot times: 50th – 2:41:17, 100th – 2:50:39, 150th – 2:57:04, 200th – 3:07:33, 300th – 3:27:03, 400th – 3:54:07, the last Scot was James Stuart (M4) in 4:03:59, the last finisher was Jimmy Hempenstall (England – M2) in 5:17:53. 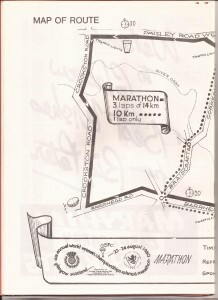 There were four finishers outside 5 hours and 50 between four and five hours. Other Scots crossing the finishing line on the first page of the results were Gordon Eadie (M2 – 2:35:10), Jim Alder (M1 – 2:35:59), John Brierly (M3 – 2:39:46), John Black (M2 – 2:42:11) and James Morrison (M1 – 2:43:16). The team races by category were as in the table. I could see no Scots women in the list of finishers and there were no women’s team results given in the official results booklet. On the Sunday evening, There was the Farewell Dinner at Tiffany’s Ballroom, Sauchiehall Street in Glasgow City Centre which had the presentation of awards for the marathon, Dinner, Dance and Cabaret. Well before the actual weekend of the championships, these functions were all sold out – and could have been sold out several times over! The brooches were a master stroke: T shirts were commonplace, medals were usually fairly cheap and mementoes rather than ‘objects of desire’. But the brooches, crafted by Carrick the Jeweller in close consultation with the organising committee were desirable in their own right. Modelled, I think, on the clan badges sold all over Scotland, they had that symbol of eternal friendship in the middle (like a figure 8 on its side) with no end and no beginning. For the marathon it was in red, for the 10K it was blue. As a gift from Scotland to every vet finisher from all over the world, from USA to Japan and Australia, men and women, it was appreciated by all who took part.